F&W’s Ray Isle discovers what happens to a bottle of wine submerged in ocean water for 150 years. Sixty feet under the ocean, off the coast of Bermuda, the water feels cold. A wet suit keeps your core warm, but your hands, feet and face feel it—at least mine did. Part of that may have been psychological, since in the filtered blue light my fingers looked bloodlessly white, but the chill was definitely there. My diving partner was Philippe Rouja, PhD, an archaeologist with an unlikely but enviable job as Bermuda’s official Custodian of Historic Wrecks. We were diving down to the Mary-Celestia, a Civil War blockade-runner that sank in 1864. The ship, a narrow, 225-foot-long side-wheel steamer, set off for South Carolina on September 6 with a load of rifles and munitions, to slip past the Union ships that barred the Confederate ports. But its Bermudan pilot inexplicably ran it into a reef so close to shore that if you stand on one of the island’s famous pink-sand beaches you can see the white buoys marking the site. The reason I’d squeezed myself into a wet suit and strapped on 50 pounds of scuba equipment was because, when the Mary-Celestia went down, in addition to its hold full of contraband, it was also carrying wine. Celestia is a well-known, well-picked-over wreck. In 2009, though, Hurricane Bill churned past the island. Underwater, the effects of hurricanes can be just as intense as they are on land, the currents they create shifting thousands of tons of sand around as easily as a child smears finger paints. In the Mary-Celestia’s case, the effects of the hurricane (plus subsequent storms) were beneficial. Sand filling the ship’s bow had been washed away. Rouja, the next time he went down, found tucked away in the tip of the bow what were most likely the personal possessions of Charles Francis Middleton, the ship’s engineer. Among them was a partial case of undamaged wine. A large audience had gathered at an old movie theater for this tasting. Many of them were Middletons; the family is significant in Charleston, and the Civil War is not exactly a forgotten topic in the South. Up front was the panel that would taste the wine: four Master Sommeliers—Larry Stone, Laura Maniec, Paul Roberts and Sara Floyd—and me. The room was hushed as Stone worked the shrunken cork out of the neck of the bottle; it was more or less cemented in by a layer of dried oceanic sludge. He poured the wine into a decanter. The liquid was exactly the color of a cement sidewalk. This is not a color associated with wine. And then we all swirled and sniffed what was in our glasses. Before I describe that experience, I have to admit that I had been feeling wary about the tasting for quite some time. 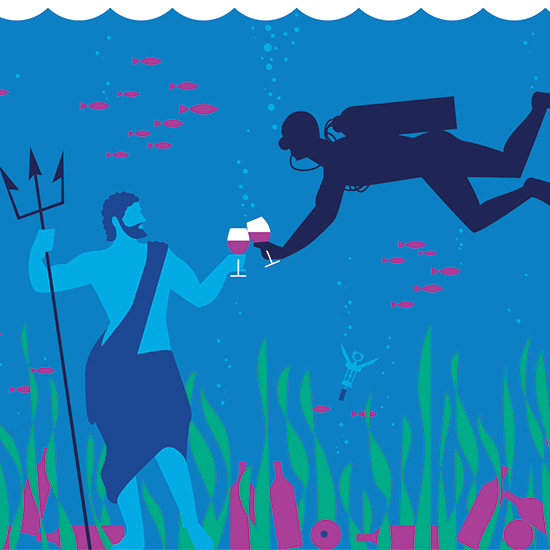 The problem is that the ocean off Bermuda’s coast isn’t really a great place for storing wine. It’s just too warm. The first rule of real estate may be “location, location, location,” but for wine storage it’s “temperature, temperature, temperature.” There is no way to cellar wine successfully for the long term unless the bottles are kept cooler than 65 degrees—ideally, around 55 degrees. The waters surrounding the Mary-Celestia are 70 degrees or so. For a human, that certainly feels cold, but for wine, it’s a warm bath. The second thing making me wary was the wine’s age. There’s another rule about cellaring wine: Don’t put something away for years that isn’t going to improve, or at the very least survive, during that time. That’s because while all wines get older, very few get better—a rule of thumb that may well be true for people, too. The number of wines that have the capacity to age for even 50 years, much less 150, is minimal. Then there’s a less-common rule of wine-aging, which I actually hadn’t run into before. It’s simple: Don’t let seawater get inside the bottle. In the end, possibly out of chivalry but more likely out of the desire not to be outdone, all of us tasted the Mary-Celestia wine. And it was god-awful. Maybe even worse than it smelled. I spit the stuff out instantly and grabbed a nearby glass of Chardonnay to rinse out my mouth. I was a little concerned that I might have permanently zapped every last one of my taste buds or, even worse, swallowed some. To put it another way, the older a wine is, the more likely it is that history trumps flavor. After the tasting, the sommeliers and I were standing around the table in front when a well-dressed elderly woman from the audience walked up. She announced, in a genteel Southern accent, “I am a Middleton, and that wine took 150 years to make its way back to my family, and I owe it to myself to try it.” Whereupon she picked up one of the glasses, took a healthy slug of the contents and swallowed it. I suspect I looked horrified, but she was undaunted. “Well, that is awful,” she stated. “But I’ve had worse.” And she walked off.